1 keep the rest of the outfit simple and neutral so the focus remains on the top and the whole look remains effortless. 2 Pick rest of the pieces in the colors on the top. 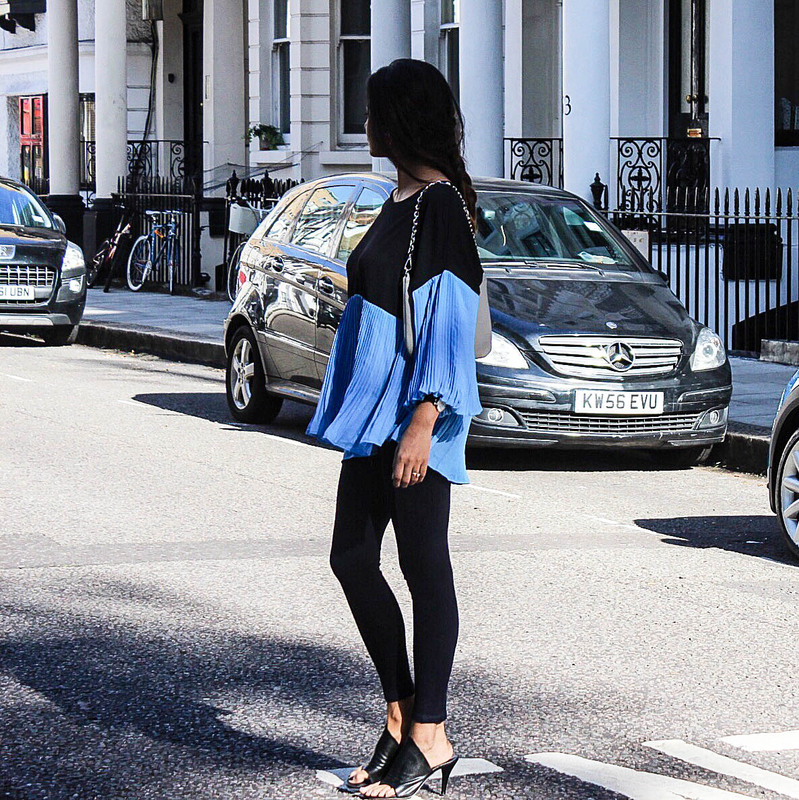 For e.g in this outfit i chose to pair my statement top with navy and light blue color blocking, pleats and bubble sleeves with plain navy leggings and sleek black (neutral) mules. It is a head turning look but very uncomplicated and effortless. 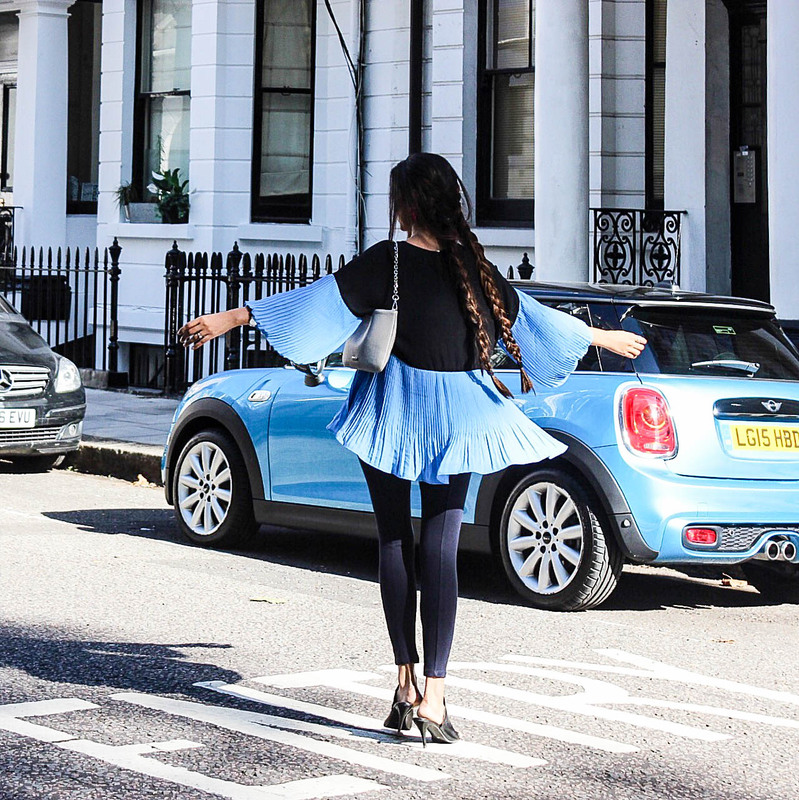 There is so much movement in this top i just couldn't stop myself from twirling. All in with the mules trend, i suggest going ahead with a black one like this which is easy to pair with everything. They instantly make any outfit trendy and relevant to 2016. 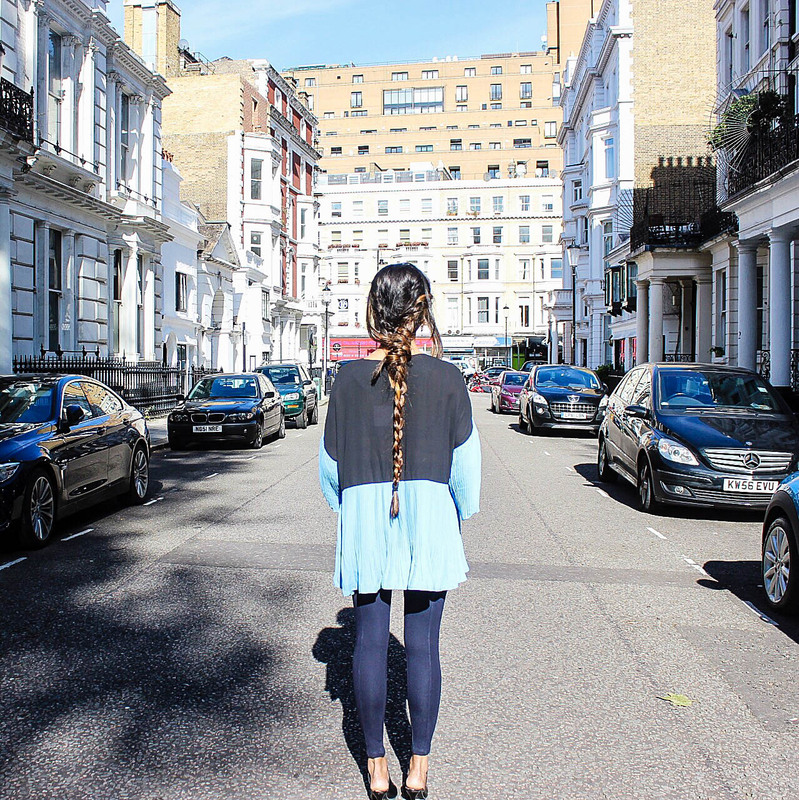 I always love to twist things a bit with my hair, like a sleek outfit with more effortless hair and on this day since the outfit was a lot elegant i kept my hair in a messy braid. This is a great look to wear on a sunny autumn day when u can neither think of baring ur legs nor putting a sweater on. This top is perfect for the weather, full sleeves and the length is almost tunic length so when it gets more cold i will just have a scarf around my neck or add a vest/ gilet on top and good to go. I have also linked some of my other similar fav tops and sweaters from chicwish have a look, they deliver worldwide. This is such a pretty top. Really a statement piece with unique style and sleeves. You look such a darling in it! Such a fabulous look you created with this gorgeous blouse. Loved it! Beautfiful top! I love the pleats and colour block design. This top is just stunning on you, I love how you styled it and gave hints of other colors in the accessories. Loving this! 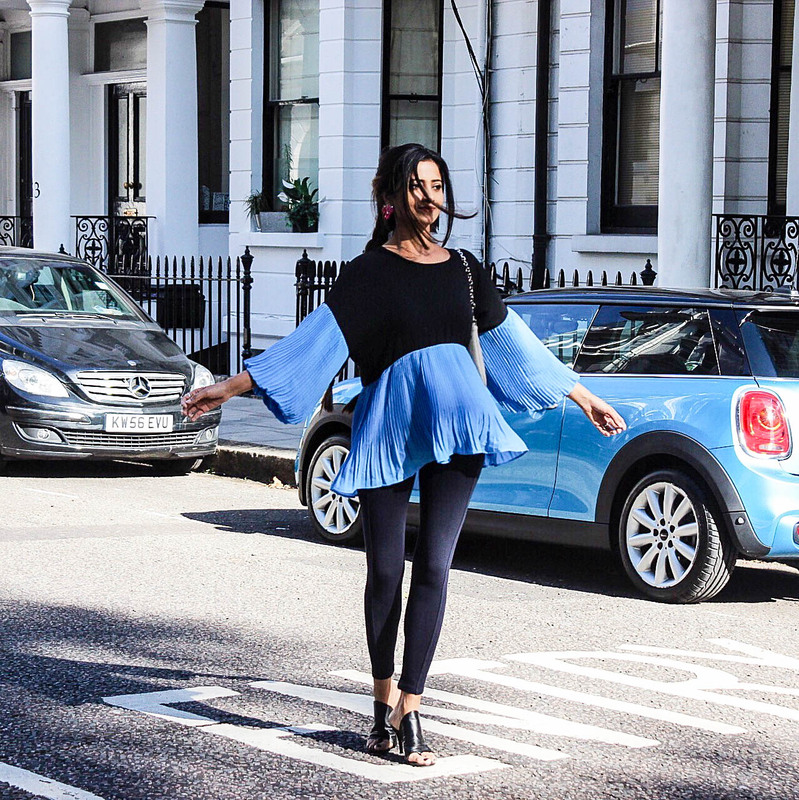 You look so beautiful in this top, Chichi, and I couldn't agree more with your tips on styling such a beautiful statement top! Those leggings look so good on you and I love those mules as well. Always so beautiful and chic! Thanks so much for sharing and I hope you have the best week ahead, beauty! Yes, amazing! Such a shame the weather won't let us wearing them.. I love this look on you - the pleated top is so beautiful and you styled it perfectly with the simple black leggings! wow I love that pleated top so much! This sweater just looks beautiful ! And so do you. Very original look ! Love the top and the colour combination- fabulous! Ahh that top is so pretty! What a gorgeous top! You styled it perfectly! Very pretty top. I have learned so much from you when it comes to styling. Yes! This is such a great look! And such a great top! I love the drama of the sleeves! This top is so fabulous and I love the shoes you styled it with! Totally fell in love with this top when I saw a snapshot on your Insta - gorgeous styling as always!! Love the color blocking. That's an adorable shirt! Great photos! Thanks for the tips. It's the sort of top that makes you want to dance and twirl all night, I agree!! Very lovely, Chichi. What a unique top. It's very flowy and fun! Beautiful top! I love the 2 toned color and the flowy look. You look lovely!